It was an amazing journey to the JavaOne this year. There I had a great chance to present some features of IntelliJ IDEA on the huge stage. I liked it. I was also amazed by the backstage processes. So many people are involved in there. The first step in the migration to modules is to make sure there are no package name clashes between files. The best way to know that for sure is to have a tool that analyze classpath for conflicts. So I created the plugin for Gradle. id 'org.jonnyzzz.java9c' version '0.2.1'  /// Mind the updates! Once the plugin is applied, it adds the java9c task. The task itself depends on several generated tasks for every source set, e.g., main or test. java9c task, prints out the detected package conflicts for each source set. For multiple project Gradle projects, you may include the plugin in the following way, or, alternatively, you may select only specific projects to check. The plugin is open source. You may find sources on GitHub. It is so easy to create so many different features. This time I decided to create a feature-poor plugin. 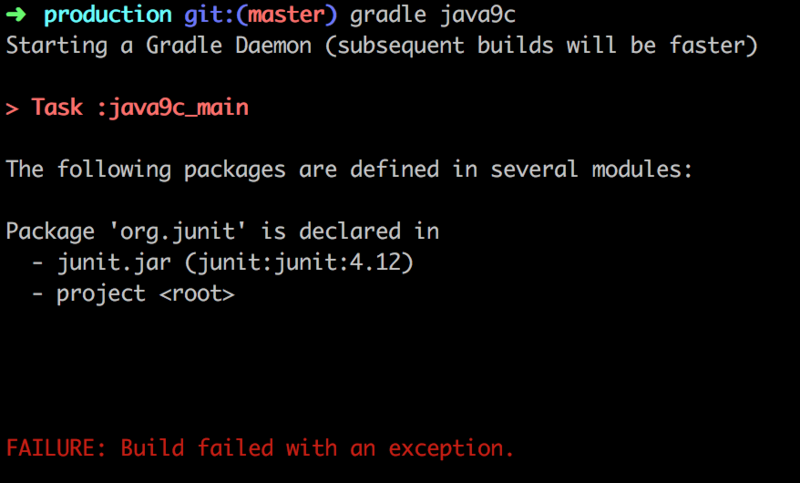 Meanwhile, I reserved the java9c extension in Gradle for future features for the plugin. Let me know if there is something I missed. Also, you may create a pull request here. Have fun! And let me know if it helps.